In July, Wendy Jang from Richmond Public Library introduced us to a fantastic book, “Is American Democracy in Crisis? Dionne and Sullivan vs. Gingrich and Strassel” by Rudyard Griffiths. The book focuses on the Munk Debate held in October, 2017 at Toronto. 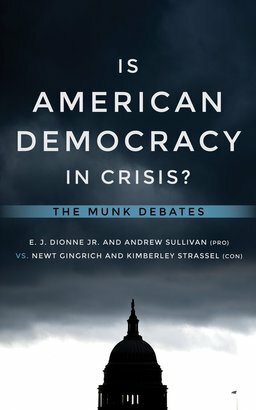 During the debate, award-winning journalist E. J. Dionne, Jr. and influential author and blogger Andrew Sullivan teamed up against former Speaker of the U.S. House of Representatives Newt Gingrich and bestselling author and editor Kimberley Strassel to debate the current crisis of American democracy.